With this month having the longest day and me liking my sleep I wasn't going to get much night time astronomy done but never the less I had a few things to do. On the weekend of the 7th and 8th June was the International Astronomy show at the Warwick Exhibition centre and I'd been looking forward to it for some time as I had a couple things I wanted to buy but wanted to get some expert advice before I did. We decided to go up to Warwick on the Friday in our motorhome and stay over so we could get a early start in the morning. As it happened this particular Friday's traffic was more than horrendous the M1 had 2 closures and it took 7hrs + to do a 2.5hr journey. The next morning we got to the exhibition centre about 9:00am and headed in, to say I was like a kid in a sweet shop was an understatement (or an Astronomer at an Astro show). In all honesty you could probably spend �k easily on an scope, mount, imager and extras but sadly my budget was limited to �0 but it didn't stop me looking and drawling over the wonders that were on show (what a geek!). One of the things I was after was some advice on guiding and what was the best way forward, using my SPC900NC or getting a new imager that would do for both planetary imaging and as a guide camera. I had a chat with Dion (from Astronomy Shed) who was on the Modern Astronomy stand regarding using my SCP900NC as a guiding camera and attaching it to the finder scope on my 200P, or upgrading the finder to a SkyWatcher ST80 however this option is actually quite expensive as my mount is pretty much at it's limit with the 200P alone so it would require a mount upgrade �0+ plus �0 for the ST80. Dion said that as Modern Astronomy do an adapter that screws into the back of a SkyWatcher finder scope that could be a way to go but my SPC900NC would need to be LX modded to enable long exposures thus picking up more light from fainter objects. 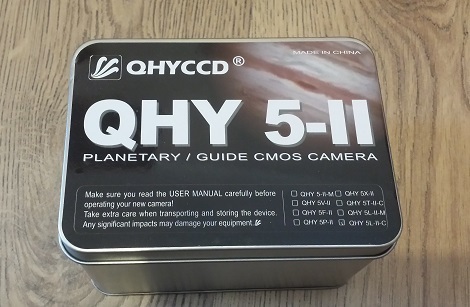 We discussed the possibly of upgrading to a new imager and he suggested the QHY5L-II colour or mono which are fairly new on the market and are at a reasonable price for an Astro imager starting from �5. Even though the mono is more sensitive than the colour and it has a larger chip it was �5 and I would also require a filter wheel and a set of filters another �0+ which would enable me to generate colour images by stacking the coloured frames together. 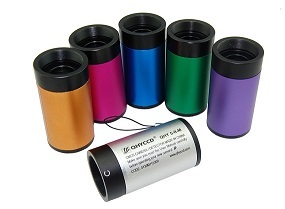 I decided to go for the colour version and appropriate adaptor to fit a SkyWatcher finder scope. The next thing on my list was a solar filter so I could start having a look at the Sun and possibly imaging it. 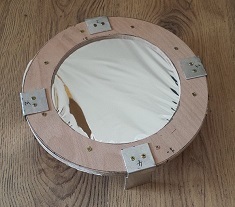 I had a look at some of the ready made filters using solar film and they started and � for a 20cm diameter scope but the film on its own was only � per A4 sheet and with me liking a little project I decided to buy a sheet and make my own filter. I also picked up a reduced subscription to Astronomy Now - which my wife kindly paid for - and some paper solar glasses for looking at the sun. WARNING: do not attempt to look at he sun without a specialist filter it WILL blind you! I did plan on getting some good binoculars for general viewing and astronomy use and out of all the ones I tried by a long way the Celestron 8 x 56 were the best and at �5 they were really reasonably priced, but in the end I decided I'd spent enough today but I'll have a look on the internet in the near future when I had a bit more money to spend. 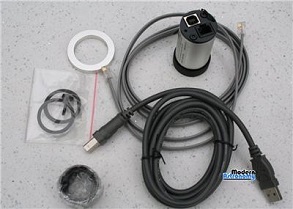 I spent quite a lot of time working on my USB focuser this month, building the hardware and writing both the Arduino code and the ASCOM driver for it - ASCOM is a standard for astronomy software and hardware thus allowing any Astro software to interact with any Astro hardware. My hardware is based on an Arduino - which is an open-source physical computing platform based on a simple microcontroller board. 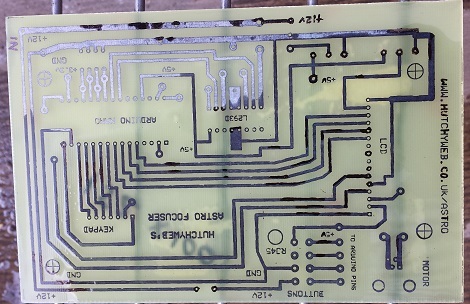 I also decided to print and etch my own PCB for the focuser. Check out both my PCB and USB Focuser how-to for more details. I managed to get the hardware that I'd made working via a RS232/Serial connection with help from a YouTube video by Tom How of Curdridge Observatory titled 'ASCOM Driver tutorial for Arduino Astronomy Hardware using Visual Studio' - I'd really recommend this as a starting point for any Arduino based Astro hardware builder. I was getting some strange results from my focuser when I was using it with SharpCap2 so I decided to contact Robin the developer for some advice, initially he gave me a few pointers but as you can imagine we are both working blind - he had the source code and I had the hardware - he sent me the source code for SharpCap so I could debug the code as I was using it which has really helped and I have now changed my Arduino code and ASCOM driver significantly and I'm close to a final fully working version. I also contacted Tom How for his input on my focuser, he was quite impressed and gave me a few pointers on how to make the code faster and better, both of which reduced the issues I was having with SharpCap2.... the work continues. 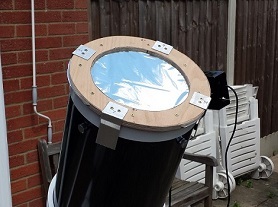 If you have read many of my previous blogs prior to this one or even if you've seen the list of how-to on the menu to the right you'd have guessed that I like to build things and enjoy a little project and as I'd brought some Solar Film at the Astronomy Show I decided to build a solar filter for looking/imaging the sun. It was a fairly easy build but I took my time as one little mistake could result in compromising the film and potentially causing irreversible damage to my eyes! The full build is available on the menu to the right but take care and make sure you read and understand all the instructions that come with the solar film it is for your safety! REMEMBER: do not attempt to look at he sun without a specialist filter it WILL blind you! Once I'd built my solar filter I thought I'd better test is out! I setup my scope in the garden and of course there are no guide start available in the day time so I relied on the mount for alignment, I set the declination to 51� and pointed the scope to North. Strangely enough it took me a little while to find the Sun in the scope - I'm sure there's a joke there somewhere living in the UK - and of course you cant find a finder scope with out a filter with an extra wide baffle to protect your from the sun (neither of which I have made as yet). Once I'd found the sun I setup my USB focus controller for it's first real test and to be honest it did do ok although the LCD stopped displaying any sensible info and I only used the key pad for the initial setup. I had a bit of an issue seeing the display on my laptop so I extended as many cables as I could to get as far indoors as I could so I could see the display and even then it wasn't all that clear. I started imaging using my SPC900NC which went quite well but when I tried to use my new QHY5L-IIc imager I couldn't get it to work as I hadn't setup the driver properly - I should have tested it prior to trying to use it. Anyhow I reverted back to the SPC900NC and below is an image of two sun spots and you can just make out some the granulation on the surface of the sun. 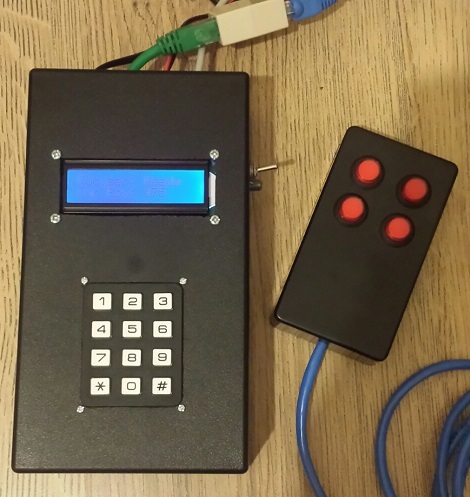 Because of the LCD and keypad issues I've had (You'll need to read the how-to for full details) I decided to make a Mk2 version of my focus controller with just a few buttons and LED's to show a couple of statuses. Above is the final built hardware and i've added it to my USB Focuser how-to for any one who fancies a go at building one or feel free to contact me and I'll help were I can.